Hospital with one entrance and two exits is a virtual reality piece created from point-cloud data generated by a laser scan acquired at the Cerrahpaşa Hospital in Istanbul. The piece responds in real-time to viewer attention; interaction shapes the the virtual space itself. 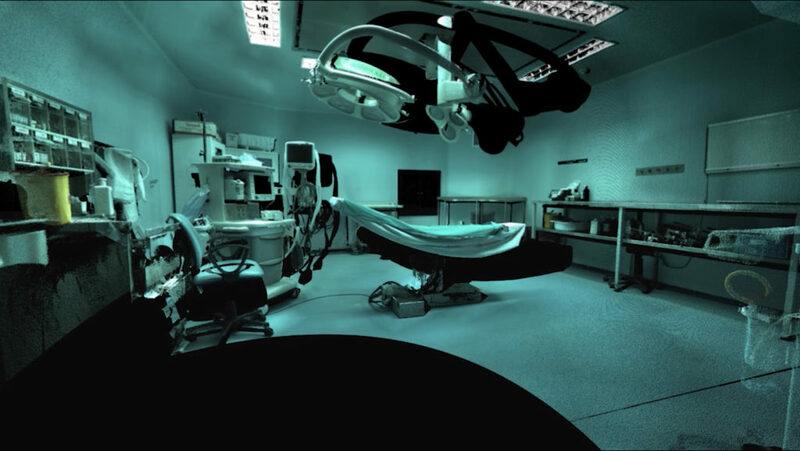 Moving through an operation room corridor–-with stretchers, surgical equipment, and the buzzing sound of fluorescent lights–-the viewer sees the hospital through machinic vision, through point clouds. The hospital is a place where tactile and intimate knowledge of the human body is enhanced by advanced medical imaging technologies to diagnose and treat the human body. In this piece, the objects and buildings are in turn subjected to a similar examination. The point cloud data transforms the space and the observer in the space. The way the building appears, disappears, is transparent and at moments quite legible forms a fluctuating consciousness, a perception that is neither of the animate or the inanimate.